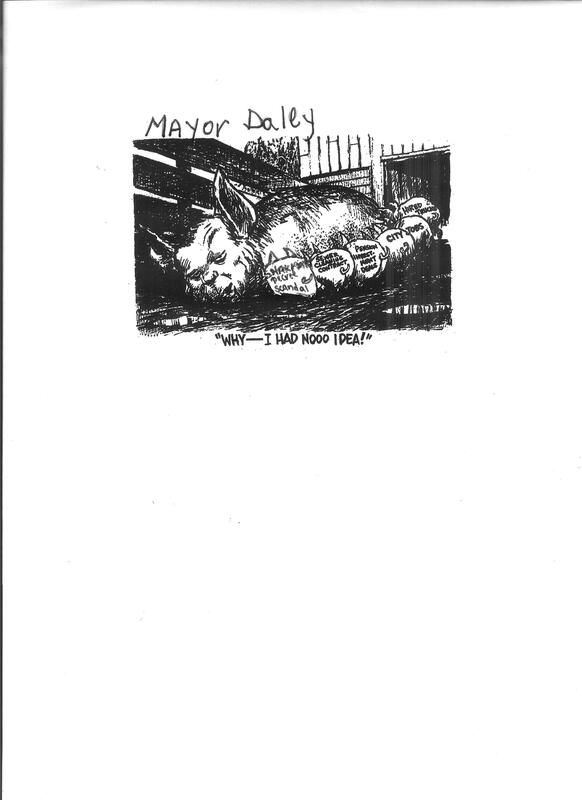 City of Chicago Mayor Richard M. Daley is always crying the same tune everytime there is a scandal tied back to him, his administration or someone in his family. Why is that in other cities when mayors are tied to corruption, something is done about it; they get indicted and go to jail or they lose their job. Why is Mr. "Teflon Don" Daley so untouchable. In the picture above are only a few of the scandals tied to his administration, they are the Hired Truck Scandal, City Jobs, Pension Investment Deals, the Sewer Cleaning Contract and the biggest fraud of them all, the Shakman Decree scandal. His favorite saying is, "Why-- I had nooo idea", give me a break. If only a criminal could use that in court to get off, "Well your honor, it wasn't me who robbed the bank, yeah I know you have my fingerprints and everyone identified me, honestly, it wasn't me, I swear." Daley knows everything that goes on under him. If he is suffering from Alhemizer's, I think he needs to be removed from power and given medical attention. All of the current City of Chicago Shakman Decree cases have to do with political hirings. During the time Eugene Wzorek was employed with the city, the Shakman Decree dealt with political firings. Michael Shakman filed suit against the Democratic Organization of Cook County, arguing that the patronage system put nonorganized candidates and their supporters at an illegal and unconstitutional disadvantage. Politicians could hire, fire, promote, transfer—in essence, punish—employees for not supporting the system, or more particularly, a certain politician. The suit also argued that political patronage wasted taxpayer money because public employees, while at work, would often be forced to campaign for political candidates. In 1972, after an exhaustive court procedure and much negotiating, the parties reached an agreement prohibiting politically motivated firings, demotions, transfers, or other punishment of government employees. A 1979 ruling led to a court order in 1983 that made it unlawful to take any political factor into account in hiring public employees (with exceptions for positions such as policy making). Those decisions along with companion consent judgments—collectively called the Shakman decrees—are binding on more than 40 city and statewide offices.